I had been dreaming of building a strawbale house for many years, despite having no experience with building. I was very idealistic, and using natural construction satisfied my goal to use nontoxic materials. I had lived in several urban intentional communities, but was ready to find a rural IC where I could build and farm. I had lived in Washington state for over a decade when I discovered Tolstoy Farm, and I was fortunate to be accepted by this decentralized community in eastern Washington. The climatic extremes of the Columbia basin are perfectly suited for strawbale buildings. In 1997 I moved to Tolstoy Farm, which was formed in 1963 by hippies, back-to-the-landers, draft dodgers, and social visionaries. They had begun building structures out of whatever they could find. Builders who had started out as amateurs went on to work in the industry and became experts in their field. By the time I arrived some of the older homes were being remodeled and modernized; others had crumbled into ruins. Between the knowledge of the people in the Tolstoy community, their willingness to teach and share tools, and the archive of success and failure that the existing buildings provide, I found a vast resource from which aspiring builders can learn. On the 180 acres owned by the community, much of which has been preserved as natural forest, there are raw materials that would not normally be available. There also exists a tradition of neighbors coming together and helping each other out when extra hands are needed. I discovered that this network of natural materials, experienced builders, and people willing to help out and share tools makes intentional community an excellent place for eco-design and natural building. The bylaws of Tolstoy Farm require residents to have as little environmental impact as possible, including that all homes be off the grid. This suited my ideals perfectly. I wanted to design my house in order to utilize the natural forces to my benefit, while protecting my structure from destructive elements. I picked a spot near enough to a creek that I could hear the water flowing, but far enough away to avoid flooding and the inevitable migration of the creek bed. I observed the wind, the slope of the terrain, geology, drainage, availability of water, access, solar exposure (especially in the winter), privacy, rain and snow fall, fire safety, food and water storage, aging, proximity to other homes and tall trees that could fall on the house. I imagined my house in ruins, being able to compost back into the earth. Observing these elements informed my eco-building design. I had hoped to use only natural construction materials such as straw, soil, clay, lime, rock, wood, metal, and water. But as I planned the structure, I had to also take into consideration how much money I had to build with and live on, which limited my time. I had also to consider the wear on my body of doing such intense physical work, and the carbon footprint involved in moving materials around. So I ended up choosing to use concrete rather than fitted rock for my foundation, tar paper as a moisture barrier in the roof, man-made metal roofing, and a worn-out set of tires packed with rock to support internal posts. Since recycled and repurposed materials are commonly used in eco-buildings, I felt good about reusing my old tires. 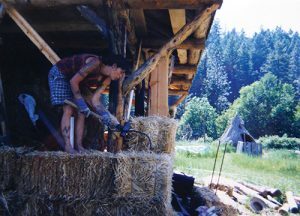 Other Tolstoy residents have replaced fiberglass with insulation made from recycled jeans, reused old barn beams rather then buying lumber, and packed an unfinished house frame with light clay (straw wetted with clay slip and packed into forms). One house was made entirely of rocks and mortar, and several underground cellars and ice houses have lovely living roofs. A log cabin stands as a reminder of the beauty of wood in the round. Another resident used fibercrete (concrete mixed with shredded newspaper) to super insulate his walls and make beautiful stairs. I used cardboard, dogwood branches, and papier mâché for my ceiling rather than sheetrock. Repurposing and recycling can save money, energy, and reduce the need for resource extraction. People who want to learn natural building and eco-design are drawn to intentional communities and become willing helpers in a fun and nontoxic work-play endeavor. Women and children become active participants, gaining skill and expertise not encouraged in conventional construction. Those with artistic inclinations will find fulfillment in the malleability of earthly materials. Natural and eco-building can be less expensive, yet more labor intensive, than conventional construction. ● A wall coated with natural plaster needs a significant roof overhang, and the two-and-a-half-foot overhang I made is not quite enough. In the winter snow slides off the roof and heaps up against the plaster, degrading it. ● I tried using dry stone work for the floor and stairs of an attached porch, but it was very unstable. Later I used concrete mortar to stabilize the rock work. ● During a winter of very deep snow I had thick ice buildup on my metal roof. Once it started to melt, the whole sheet slid down and smashed my stovepipe. My partner then designed and welded a V-shaped ice splitter that we mounted above the stovepipe to prevent this. ● While it is soothing to have a river or creek flowing close enough to hear it, I have seen several homes swamped during floods. I took care to place my house more than 100 feet away from the creek. ● My experimental papier mâché ceiling has held up pretty well on the inside, but not so well outside under the eaves. Moisture decayed the paper, allowing wasps, bats, and flying squirrels to move in. Last winter I removed the damaged areas and lined the eaves with hardware cloth and tar paper, which I secured to the top of the walls with a decorative arrangement of apple and pear cuttings. ● My adobe floor is soft and beautiful, but areas with heavy wear develop potholes and cracks. Chair legs bore holes as well. I have tried many different recipes for patching, and have found oat water mixed in with my usual mix of fine fiber, sifted sand, dirt, and clay to work wonders. Using a hole saw, I cut disks out of plywood, screwed them to the bottom of the chair legs, and glued a layer of homemade felt to the bottom. This solved the chair problem. ● I used scavenged one-and-a-half-inch pipe for my drain, and buried it under the adobe floor. I ignored the advice of a seasoned builder who said this was a mistake. The drain pipe got plugged up as predicted. I recently rerouted a new drain through the wall which feeds through proper drain pipes and into a buried hugelkultur greywater system. ● I visited a cob/strawbale hybrid cottage in Oregon where the builder had used curved saplings for window headers, creating an arch. The weight of the strawbales and cob stacked on top of this was too heavy and broke the window. Learning from this I made two-inch by 16-inch wood headers using a chainsaw mill and allowed two to three inches between the window and the header to accommodate settling of the walls. I filled this gap with long cigars of straw wrapped with string, and plastered over it. In some places I have successfully stacked 10 vertical feet of bale wall on top of these window headers without compromising the window. Even when things go wrong and the natural builder has to undo and redo, this is a nontoxic job. Most materials can be reused, and there is little to no trash. Natural plaster and cob can be rewetted, remixed, and put back into action. While professional builders often use a modified cement mixer to blend plaster, I used the simpler method, mixing plaster on a tarp on the ground and squishing it with bare feet. This mix is safe for the skin; the clay in the mix can actually draw venom out of pesky bug bites. Once your feet are rinsed off from mixing cob or plaster, they feel super clean! This divergence from the caustic contents of concrete enables participation by young and old alike without protective gear. Which of the many natural and eco-building options are best really depends on the climate and the locally available materials. Strawbale building has shown promise in climates with extremes of heat and cold, and where grains are grown. Light clay has been used to infill conventionally framed structures, replacing fiberglass. When plastered, the walls look similar to bale walls, but lack the extra insulating value. Old tires are filled with rammed earth in the earthship homes popular in the Southwest. Cob and adobe bricks are appropriate wherever there is enough soil; rock building, where there is an abundance of rock; log building, where there is an abundance of logs. Underground structures like cellars, ice houses, basements, and hillside hobbit holes are incredible temperature regulators but must be placed well away from flood waters and need good ventilation to prevent mold. Retrofitting and remodeling with eco-materials is a good option for those wanting to replace toxic elements while saving the framework of a beloved home. When to retrofit or rebuild is a decision made after careful inspection of the structure. Is the design workable or inadequate for the conditions? Is the the frame rotten or infested with termites? If so you may regret the time spent trying to revive the dead. As long as the frame and roof are sound and not infested with rodents or insects, it is likely rebuildable. If the foundation and location are still suitable, an eco-remodel is the best response to limits that a community may place on new construction. It may not save time nor headaches, as rebuilding involves tearing down and hauling off trash, then figuring out how to make what you want out of what is left. Retrofitting with strawbales requires extending the roof out and/or reducing the inside floor space, changing the window and door frames, and assuring the foundation is adequate. I found natural building to be a fine way to live my ideals. By collecting downed trees I framed a house without the killing of live trees. By milling boards with a chainsaw mill I did not support the timber industry. By using local strawbales, dirt, sand, clay, and cardboard I avoided using sheetrock and fiberglass. Two years after I started, I moved into an unfinished yet livable shell. By utilizing the extra labor offered by community members, I created a super-insulated unique home with raw materials for under $5000. It took several more years to finish the walls and floor. Now, in 2018, it has been 20 years since I started, and I also have a rock porch, a cob root cellar, a log-framed outbuilding, a greenhouse framed with curved saplings, and a cob bread oven. The most recent improvements include a well, a hugelkultur greywater drain, and upgraded solar power. I hope my story inspires others to use natural building and eco-materials to construct durable, nontoxic, low-impact, energy-efficient, and creative structures. With determination, hard work, and the support of an intentional community, you too might be able to create the home of your dreams. Laura Harris is a 20-year member of the Tolstoy Farm community, where she enjoys communal living, organic farming, and fiber arts.